2002-06-18 Assigned to HEWLETT-PACKARD COMPANY reassignment HEWLETT-PACKARD COMPANY ASSIGNMENT OF ASSIGNORS INTEREST (SEE DOCUMENT FOR DETAILS). Assignors: BAUER, JASON M.
A method for distributing windows in a computing device desktop, comprises opening at least one window in the computing device desktop. The method continues with distributing the at least one window in response to a control input such that at least one window is resized and located to fit the desktop such that the icons in the at least one distributed window can be viewed by a user of the computing device. On occasion, a user may simultaneously display several application windows on a computing device display, thus requiring the user to manipulate the windows so as to be able to view the entire contents of the display. If the user has a large number of files or applications open at one time, it can be difficult to select the windows between which an icon is to be dragged. The user may have to resize and relocate multiple windows in order to accomplish this task. FIG. 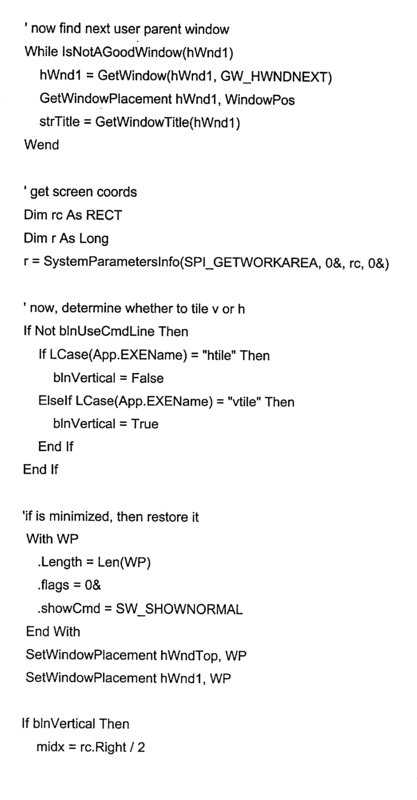 6 is a flowchart of a method for distribution of application windows in a computing device desktop in accordance with another embodiment of the invention. FIG. 1 is a block diagram of a computing device in accordance with one embodiment of the invention. The computing device includes processor  100 that controls the operation of the computing device as directed by an operating system running on the processor. An example of such a processor is a POWERPC™ or PENTIUM™ processor. Processor  100 is coupled to memory 105. Memory 105 is used by the processor to store data for display as well as data being processed by processor 100. Memory 105 can include semiconductor memory such as random access memory (RAM), read only memory (ROM), or a variety of other memory technologies. Storage media  110 is used by processor 100 to store data for longer-term storage than that provided by memory 105. Examples of storage media 110 include floppy disk drives, optical and magnetic disk drives, and other types of non-volatile storage media. Storage media 110 can be removable or resident within the computing device of FIG. 1. Processor  100 is additionally coupled to display 115 so that information can be displayed to the user of the computing device of FIG. 1. Display 115 may be a liquid crystal display (LCD), a cathode ray tube (CRT), or may make use of any other display technology. In the embodiment of FIG. 1, processor 100 runs an operating system that includes a graphical user interface that allows the user to drag icons between applications and within the desktop. The user of the computing device of FIG. 1 uses input device  120 to enter data used by processor 100 in generating desired information under the control of the operating system and/or an application program. Input device 120 may be a standard QWERTY-style keyboard with a mouse or trackball, or any other device that supplies inputs to the graphical user interface portion of the operating system running on the computer of FIG. 1. The computing device of FIG. 1 also includes input/output ports  125 to communicate data outside of the computing device. Input/output ports 125 can include Universal Serial Bus ports, FIREWIRE ports, serial and parallel ports, or any other type of input/output port. The computing device of FIG. 1, which includes processor  100 memory 105, input device 120, and an operating system that includes a graphical user interface are but one embodiment of a device that provides windows in which various applications, such as file management, word processing, and electronic mail, can be executed. In one embodiment, two or more of the open windows' locations and sizes are adjusted so that the two or more windows are sized and displayed simultaneously according to a user-defined list of rules. Embodiments of the invention can be practiced on any computing device that executes the instructions required to accomplish the various embodiments. FIG. 2 is an illustration of a computing device desktop in which an embodiment of the invention may be practiced. The desktop of FIG. 2 is representative of a desktop used in the WINDOWS™ operating system. It is contemplated that the desktop includes a number of icons ( 200) that represent computing device files, computing device programs, or other desktop objects or images. Also shown in FIG. 2 is control strip 215, which may be used to access other files and programs that can be executed on the computing device. If the computing device user has opened a file, the opened file is contemplated as being displayed in a window on the computing device desktop. In the embodiment of FIG. 2, the computing device user has opened files corresponding to windows  201, 205, and 210 in a consecutive manner. As the file corresponding to window 201 has been opened prior to the files corresponding to windows 205 and 210, window 201 appears on the computing device monitor as being on the bottom of or “below” open windows 205 and 210. Since the file corresponding to window 205 was opened second, this window is located on top of window 201 but below window 210. Finally, the file corresponding to window 210 was opened last and is therefore on top of windows 205 and 201. As illustrated in FIG. 2, in the event that the user wishes to move files from an obscured portion of window 201 to window 210, the user must first uncover the file from the obscured portion of window 201. FIG. 3 is an illustration of a computing device desktop after operation of an embodiment of the invention. In this embodiment, the last two windows opened (windows  205 and 210) are expanded and distributed horizontally so that the two windows are resized to occupy substantially the same size of the desktop. In the example of FIG. 3, it can be seen that the combination of windows 205 and 210 substantially fills the entire computing desktop. The computing device user may now readily vertically drag and drop icons between windows 205 and 210 as no portion of the opened windows is obscured from the user's view. FIG. 4 is an illustration of a computing device desktop after operation of another embodiment of the invention. In the embodiment of FIG. 4, windows  205 and 210 are distributed vertically and resized to be of substantially equal size. In other embodiments, however, these windows may be of unequal size, as the computing device user may wish to emphasize the operations being performed in the larger window while occasionally only monitoring the operations performed in the smaller window. In FIG. 4, the combined area of windows 205 and 210 substantially fills the computing device desktop. The computing device user may now horizontally drag and drop icons between windows 205 and 210. Further, no portions of either window are obscured from the user's view. FIG. 5 is a flowchart of a method for distribution of application windows in a computing device desktop in accordance with an embodiment of the invention. The computing device of FIG. 1 is suitable for executing the method of FIG. 5. The method begins at step  400, in which the user of the computing device opens at least one window on the computing device desktop. At step 401, the user activates a function key. At step 402, in response to the activation of the function key, the operating system is queried to determine the number of windows open on the display as well as the programs associated with each of the opened windows. These programs may include processing applications, electronic mail programs, Internet browsers, and so forth. The method continues at step 405 in which the number and the associated applications of the open windows returned by the operating system is evaluated. At step  410 a user-defined list of applications is evaluated to determine if all of the applications on the user-defined list are currently opened. The user-defined list evaluated in step 410 can be located in a configuration or preferences file accessible to the operating system. The user-defined list evaluated in step 410 may include as few as one application or may include as many as five or more applications. At step 412, a decision is made as to whether there are applications that need to be opened, thus allowing for the possibility that the user-defined list includes application programs that are not currently open on the desktop. If all of the applications on the user-defined list are opened, the method continues at step 420. If there are applications on the user-defined list that are not currently opened, these applications are launched, in step 415. At step  420, the operating system is requested to allow control over the size of a number of the windows. At step 425, the screen size of the display is read. At step 430, the windows corresponding to each of the user-defined applications are distributed according to user-defined rules stored in the configuration file, such as the horizontal distribution of FIG. 3 or the vertical distribution of FIGS. 4. In some applications, all of the steps of FIG. 5 may not be necessary. 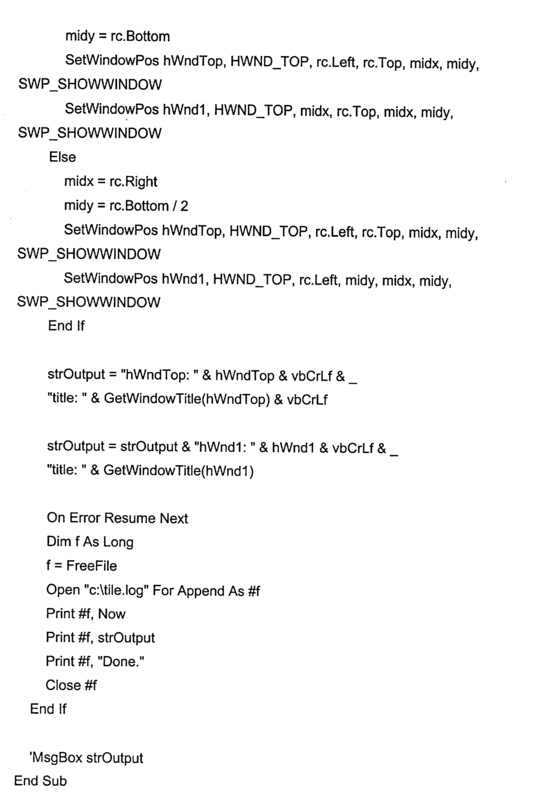 For example, an embodiment of the invention may include only the steps of opening at least one window on the computing device desktop (as in step  400) and distributing the at least one window in response to an input (such as the keyboard input of step 401). The input of step 401 causing the computing device to distribute the at least one window such that the at least one window is resized and located to occupy the desktop wherein the area in the at least one distributed window can be viewed by the user of the computing device. At step  500, the method of FIG. 6 begins by accepting inputs from the user to open at least one window on the computing device desktop. 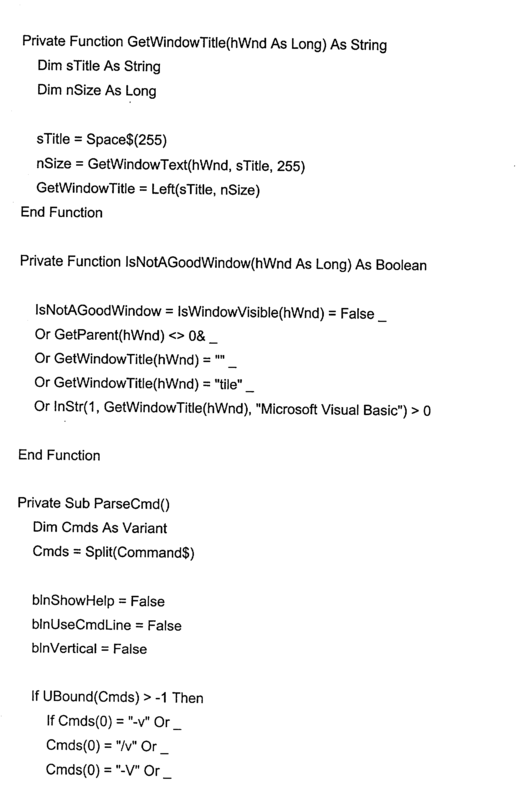 The at least one window can correspond to any application program that can be run on the computing device. At step 505, the computing device receives an input to distribute the window(s) on the desktop. At step 510, the current order of open windows is determined using any suitable ordering scheme. In one embodiment, the most recently opened window(s), which desirably appears in front of any previously opened windows, is assigned a “Z” order of zero (or Z=0). The next most recently opened window, appearing immediately behind the Z=0 window, is assigned to Z=1. Previously opened windows are assigned successively increasing values of Z, however, only one window (such as the Z=0 window) need be opened in order to for the method of FIG. 6 to be invoked. At step  515, the operating system is requested to allow control over the size of the last-one or more opened application windows (Z=0, Z=1, Z=2, and so forth). At step 520, the screen size of the display is read. At step 525, the last one or more opened application windows are distributed either horizontally or vertically such that each window occupies a portion of the display area. 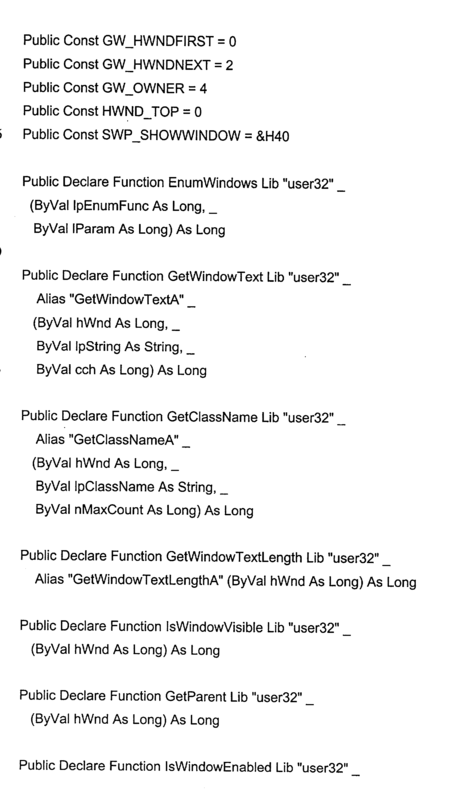 Step 525 may include reading a configuration file to determine the area occupied by the distributed windows. Additionally, nothing prevents dividing the screen according to the number of applications present in the configuration file. Thus, three applications listed in the configuration file may result in the automatic distribution of the windows in which each window occupies one-third of the screen area. The embodiments of FIGS. 5 and 6 can be stored as a computing device-readable code data file comprising a set of instructions in the memory of the computing device of FIG. 1. In these embodiments, the data file could take the form of a macro program and be executed from memory  105. In other embodiments, the computing device-readable code data file may be stored on and executed from storage media 110. In an exemplary embodiment A computing device-readable medium having computer readable instructions causes the computing device to execute the steps of opening windows on a desktop of the computing device display (as in step 500), receiving an input to distribute the opened windows (as in step 510) on the desktop of the computing device display, requesting an operating system that runs on the computing device to allow control over the opened windows (as in step 515), and distributing the opened windows within the computing device display (as in step 525). In some applications, all of the steps of FIG. 5 may not be necessary. For example, an embodiment of the invention may include only the steps of opening a window on the desktop of the computing device display (as in step  500), requesting an operating system to allow control the opened window (as in step 515) distributing the opened window within the computing device display (as in step 525). 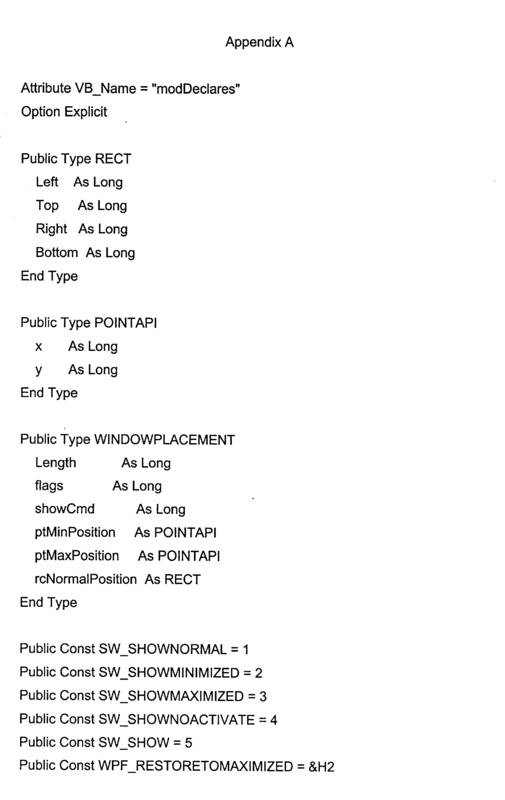 opening at least one window on the computing device desktop; and distributing the at least one window in response to a keyboard input such that the at least one window is resized and located to occupy the desktop wherein the area in the at least one distributed window can be viewed by the user of the computing device. 2. 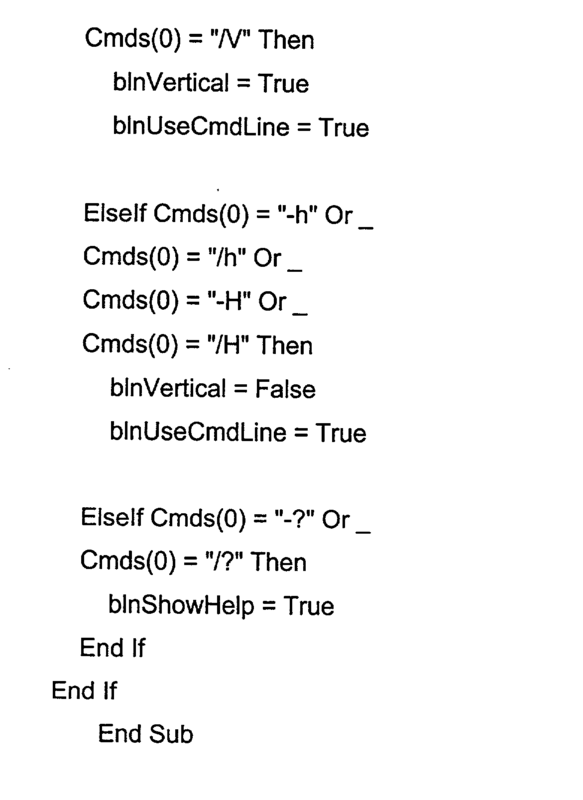 The method of claim 1, wherein the opening step comprises opening at least two windows, and wherein the distributing step includes distributing the at least two opened windows such that the at least two opened windows are resized and located to occupy the desktop such that the area in the at least two opened windows can be viewed by the user of the computing device. 3. The method of claim 2, wherein a first window of the at least two opened windows expands horizontally and relocates to a top portion of the computing device desktop and wherein a second window of the at least two opened windows expands horizontally and relocates to a bottom portion of the computing device desktop. 4. 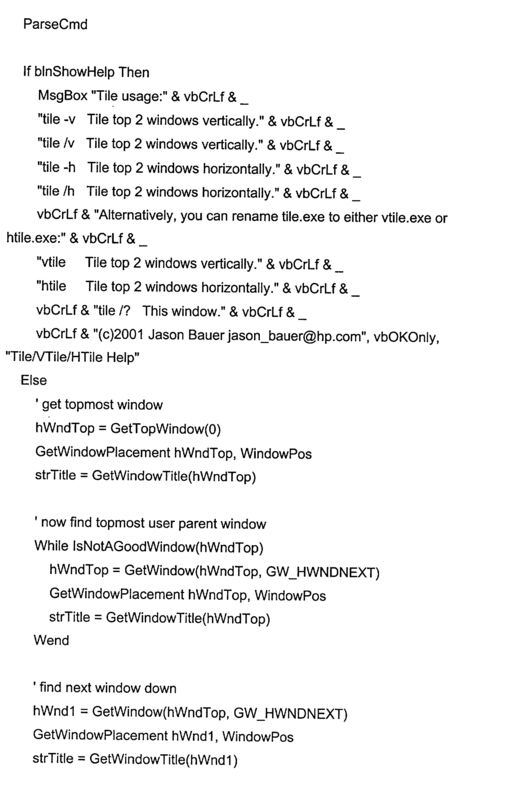 The method of claim 2, wherein a first window of the at least two opened windows expands vertically and relocates to a left side portion of the computing device desktop and wherein a second window of the at least two opened windows expands vertically and relocates to a right side portion of the computing device desktop. 5. The method of claim 2, wherein a first window of the at least two opened windows occupies a greater area than a second window of the at least two opened windows. 6. The method of claim 1, additionally including the step of determining whether the at least one window is associated with an application listed in a user-defined list. means for distributing the plurality of opened windows in response to the received input such that at least two of the plurality of opened windows are distributed such that any icons located in each distributed window are visible on the display. 8. 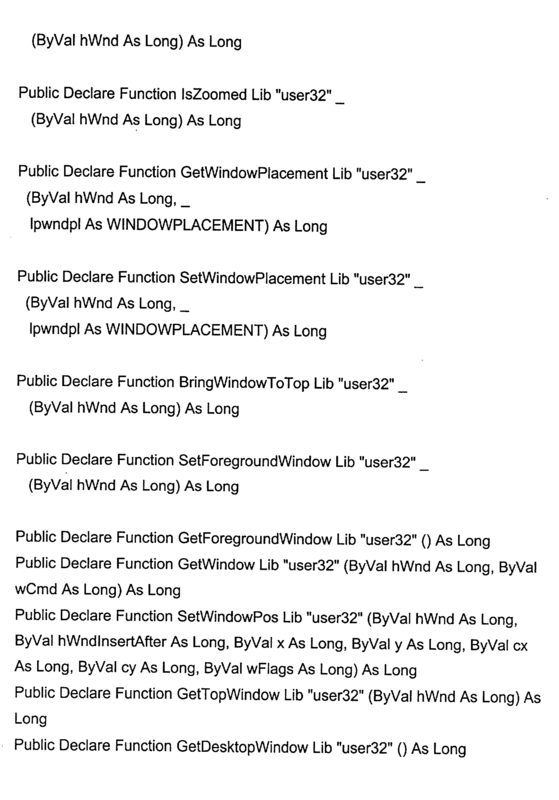 The apparatus of claim 7, wherein the at least two of the plurality of opened windows correspond to applications in a user-defined list. 9. The apparatus of claim 7, wherein the at least two of the plurality of opened windows comprises the last two windows opened by the user of the computing device. 10. The apparatus of claim 9, wherein the means for distributing expands a first window of the last two opened windows horizontally and relocates the first window to a top portion of the computing device display, the means for distributing additionally expanding a second window of the last two opened windows horizontally and relocating the second window to a bottom portion of the computing device display. 11. The apparatus of claim 7, wherein the means for distributing expands a first window of the last two opened windows vertically and relocates the first window to a left side portion of the computing device display, the means for distributing additionally expanding a second window of the last two opened windows vertically and relocating the second window to a right side portion of the computing device display. 12. 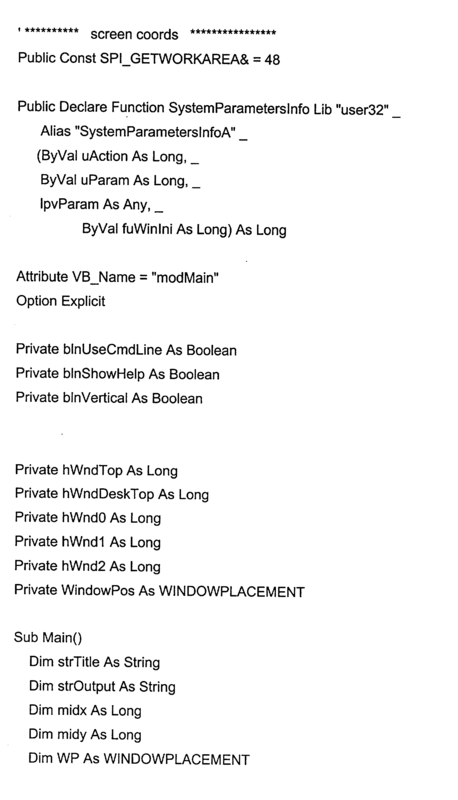 The apparatus of claim 7, wherein the means for distributing additionally determines, from a configuration file, the at least two windows to be distributed. distributing the certain ones of the plurality of the opened windows within the computing device display. 14. The method of claim 13, additionally comprising receiving an input to distribute the certain ones of the plurality of the opened windows within the computing device display, the receiving step being performed prior to the requesting step. 15. The method of claim 13 further comprising determining the current ordering of the opened windows, the determining step being performed prior to the requesting step. 16. The method of claim 13, further comprising the step of reading the screen size of the computing device display. 17. The method of claim 13, wherein the certain ones of the plurality of the opened windows correspond to the last two opened windows and wherein the distributing step includes distributing the last two opened windows within the computing device display. 18. The method of claim 13, wherein each of the certain ones of the plurality of the opened windows distributed on the computing device display occupies a substantially equal area. 19. The method of claim 13, wherein at least one of the certain ones of the plurality of the opened windows distributed within the computing device display occupies an area substantially unequal to at least one other of the certain ones of the plurality of the opened windows distributed within the computing device display. distributing the plurality of the opened windows within the computing device display. 21. The computing device-readable medium of claim 20 wherein the computing device-readable medium stores program instructions that enable a first window of the plurality of opened windows to expand horizontally and relocate to a top portion of the desktop, the instructions also enabling a second window of the plurality of opened windows to expand horizontally and relocate to a bottom portion of the computing device display. 22. The computing device-readable medium of claim 20 wherein the computing device-readable medium stores program instructions that enable a first window of the plurality of opened windows to expand vertically and relocate to a left side portion of the desktop, the instructions also enabling a second window of the plurality if opened windows to expands vertically and relocate to a right side portion of the desktop. opening a plurality of windows on the computing device desktop; and distributing the plurality of windows in response to an input such that certain ones of the plurality of windows are resized and located to occupy the desktop, wherein the area in the at least one distributed window can be viewed by the user of the computing device. 24. The method of claim 23 wherein a first window of the certain ones of the opened windows expands horizontally and relocates to a top portion of the computing device desktop and wherein a second window of the certain ones of the opened windows expands horizontally and relocates to a bottom portion of the computing device desktop. 25. The method of claim 23, wherein a first window of the certain ones of the opened windows expands vertically and relocates to a left side portion of the computing device desktop and wherein a second window of the certain ones of the opened windows expands vertically and relocates to a right side portion of the computing device desktop.